In 2014, I made pineapple paste from about 10-15 pineapples and the work was just tedious. The skinning, the grating, the boiling, cooking, storing just wears me out. But the end product when it is put on the tart and baked, is just perfect. And I will not buy anywhere else ever again. So every year, I will try my best to do some within my comfortable time. 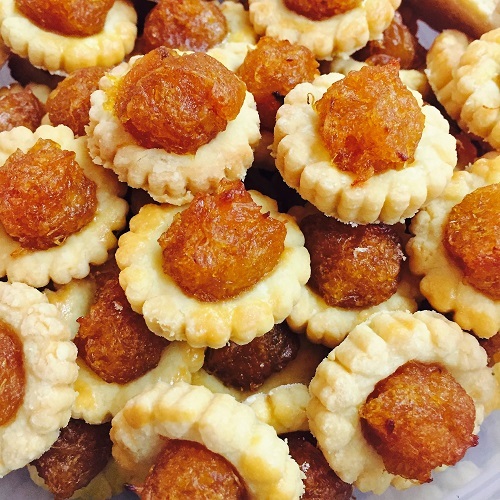 With the pineapple paste that I made in previous post, I started making the tarts, so as to prepare for the upcoming Chinese New Year. The steps are not difficult nor confusing, but it requires a bit of taking in and out of the fridge as the butter melts pretty fast. First, sift the plain flour, corn flour, salt and icing sugar together. 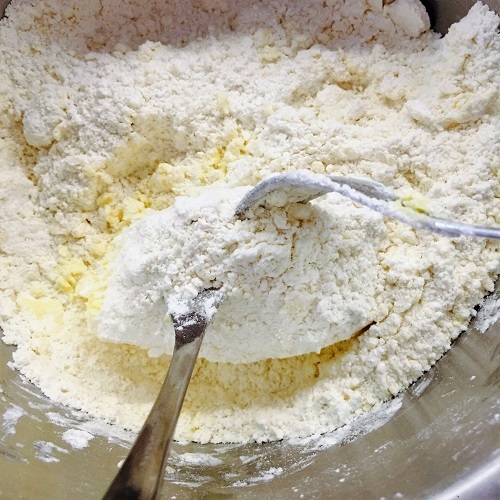 Once that is done, use a fork and poke the cold block of butter and sink into the flour. Using another fork, scrap the butter with the pointed edge and coat it with the flour. 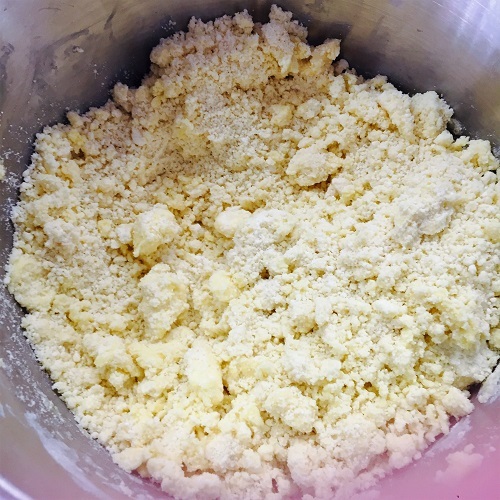 Repeat till all scrapped butter is coated with the flour. If required, use your fingertips and continue rubbing the bigger pieces to break them down. Then, beat together the egg yolks and vanilla extract. 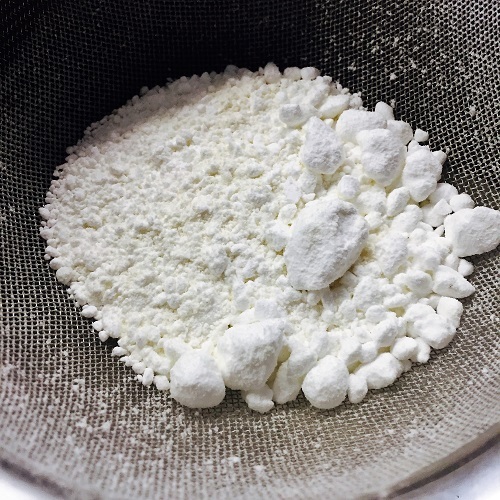 Add this to the butter-flour mixture. Using your finger tips, slowly bring all the crumbs together into one large dough. But do not knead. As long as the dough is formed, stop and put in the fridge for 10 mins, covering it with a piece of cloth so that it will not get too dry. The purpose of putting into the fridge is to let the dough settle and harden a little so that it is easier to handle later. After 10 mins, bring a portion of the dough, keeping the remaining into the fridge to keep cool. 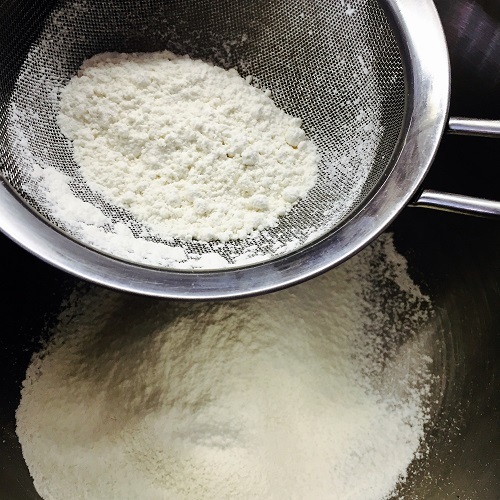 Spread some plain flour unto the working table to ensure that the dough does not stick to the table. Roll out to about 7-8 mm thick, or your desired thickness. Spread more flour unto the rolled out dough to prevent the dough from sticking to the cutter. Using a cutter, cut out the dough and arrange them neatly on the baking tray, sprinkled with a bit of plain flour. Try to place them around 1.5cm apart. 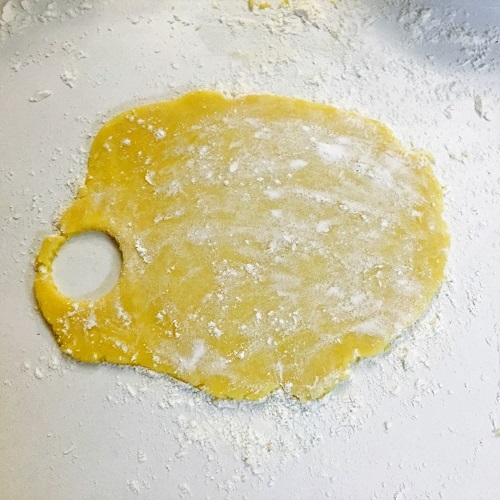 The dough can become buttery as you handle it, so be fast and use a portion at a time. Once you have arranged them, glaze them with the egg yolk mixture. 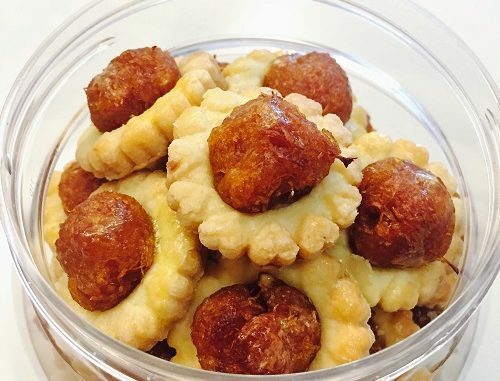 Roll the pineapple paste into balls. 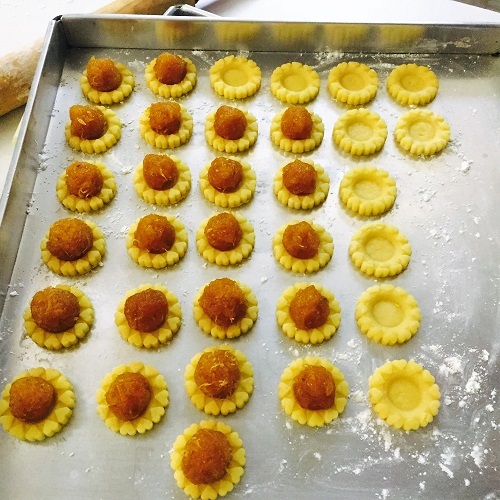 Place the pineapple paste balls unto the tart shells. Once your oven is preheated to 160 deg C, bake the tarts for 13 mins, and then turn it the other side and bake for another 13 mins. Cool on a cooling rack before keeping them. As there are not preservatives in this recipe, try not to keep for too long.